Merging imagination with a palpable expressive force the work of Palancar (a.k.a. Darrell Burgan) radiates optimism, and an immediate emotional response. From moving mood pieces to catchy New Age fare his album Serenitatis (77'25") is bristling with ideas. A trip out of the human realm, the 11 tracks cause us to feel anew the wonder of the Earth's moon and inspire contemplation about our place in the Universe. While the synth-dreams of 2006's Elysium Planitia feel fully formed, on Serenitatis Palancar surpasses even his previous achievements. 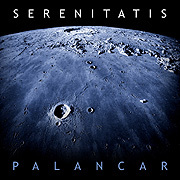 Paralleling notable works by Erik Wollo and Giles Reaves, Serenitatis elegantly explores the lunar surface as well as it does the full range of moods, textures and atmosphere known in contemporary synth music. A rapturous choir entwines with airy melodies that flitter above swelling tones, recede then float away. As a hollow drone peaks over an audio clip of voices from the moon, and buzzing sequencer patterning runs between warm bass lines and enchanting electronic chimes, these twinkling arrangements seem surrounded in a numinous aura. Burgan's music is intricately constructed and obsessively detailed, yet mysteriously his instruments seem to pulse with a living energy on their own. His eloquent reflections posses a simple dignity, heard in polished poetic leads and whispering murmurous tones.